A firm of architectural sculptors and ornamental plasterers, founded in 1886, by Robert A McGilvray (1849-1914) and Richard Ferris (fl.1886-1914). McGilvray trained with , and aquired the business on the latter's death. A generous donor to GSA , he regularly sponsored the school's prizes, and provided their winners with opportunities for employment in his studios. His most important protoge was Richard Ferris . A pupil of J Mossman and Frank Leslie 's at the school, he came to McGilvray's notice in 1886, when he won a cash prize donated by McGilvray for Ornamental Design, and was immediately offered him a partnership in his firm. Based at 129 West Regent Street, McGilvray & Ferris became the city's most successful providers of interior and exterior decor, often securing the contracts for both firm of its kind in Glasgow, rivalling were responsible for the decorative carving on many Glasgow Style buildings and the plasterwork in several others, such as Norwich Union Chambers (1898). Working for Honeyman, Keppie and Mackintosh, they executed the carving on the Canal Boatmen's Institute (1891, dem. 1966); a memorial tablet at Bellahouston Dispensary (1900); C R Mackintosh 's plaster panels in the Willow Tea Rooms (1903) and the carving on Scotland Street School (1904-6); the statues on T. & R. Annan's Sudio (1903-4); and the carver and plaster work on the fa�ade and interiors of Dineiddwg (Gaelic, pron: 'Dinaevig'), Milngavie (1906). They also executed the carver work on Mackintosh's Queen Margaret College (1894), but this was hidden from public view in the 1930's, when the building was enveloped by BBC Scotland's Broadcasting House. Ferris operated independently as a sculptor exhibiting a Portrait Medallion (1885); a Study of a Head (1892) and portrait busts of Dr. James Adams (1890); H. Wallace (1895) and Sir John Ure Primrose (1906) at the RGIFA . He later taught modelling at evening classes in the Industrial Arts Department at the Glasgow and West of Scotland Technical College (GWSTC, now University Of Strathclyde), from September 1903 until March 1907, at a salary of �30 per session, and Modelling and Hammered Metal Work in the college's annexe at the Industrial Art Rooms, 78 North Hanover Street. McGilvray & Ferris amalgamated with George Rome & Co. after McGilvray's death in 1914. Details on Ferris' life and career after this are not known. 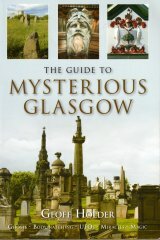 The team at glasowsculpture.com are grateful to Margaret Harrison, Archivist, University of Strathclyde, for information on Ferris' employment at the Glasgow and West of Scotland Technical College. GWSTC: Minutes, 1903-4, p.p. 54, 177, 1907-8, p. 32.